As more companies choose to shift some of their IT platforms to cloud computing infrastructure, they seek information and guidance that will help them to evaluate the vendor leaders in the market. In particular, CIOs and enterprise Line of Business leaders want open architectures for their Hybrid IT scenarios. IHS Markit released findings from its latest study, which profiles and analyzes the top seven revenue producers for cloud IT infrastructure services: Amazon (AWS), CenturyLink, Equinix, Google, IBM, Microsoft (Azure) and Rackspace. IHS created a scorecard that evaluates the leading off-premises cloud IT infrastructure service providers on criteria using available data -- including direct feedback from buyers, provider market share, market share momentum, company financials, brand recognition, reputation for innovation and other benchmarks. Cloud infrastructure providers are classified by IHS as a Leader, Established or Challenger depending on their overall score. 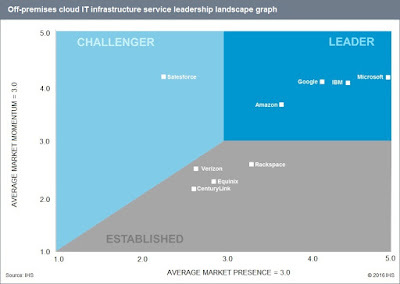 For 2016, Amazon, Google, IBM and Microsoft received the leader designation for cloud IT infrastructure services, while CenturyLink, Equinix and Rackspace were identified as established players. "Leadership in the cloud IT infrastructure services market requires very strong in-house software development skills, and all the leaders in our Scorecard have a long history of innovation. This is not expected to change moving forward," said Cliff Grossner, senior research director at IHS Markit. According to the IHS assessment, established players are able to leverage an existing services client base to which they can offer operational efficiencies. Although they have lower market momentum than the leaders, their significant presence indicates strong adoption of their solutions. The off-premises cloud service market segments analyzed for this scorecard include infrastructure as a service (IaaS), cloud as a service (CaaS) and platform as a service (PaaS). Most enterprise CIOs continue to evaluate cloud vendors on a broad variety of criteria, including their ability to provide on-premises cloud IT infrastructure. The investment in legacy IT platforms that are already built in on-premises data center environments is a huge concern to execuitve decision makers. Clearly, there will be situations were on-premises private cloud solutions are preferred. While some companies continue to procure public cloud services in isolation (i.e. for specific short-term applications), cloud infrastructure purchases are typically assessed as part of a comprehensive, forward-looking corporate business strategy. CIOs must ensure that the Hybrid IT model they embrace doesn't trap them in an architectural cul-de-sac, where the options are inherently limited by vendor capabilities. Large companies value the ability to choose from local on-premises cloud infrastructure solutions, hosted 'dedicated' cloud infrastructure solutions, and multi-tenant 'shared' public cloud infrastructure solutions. Each cloud computing option has pros and cons, relative to the specific workload requirements under consideration. Truely open full-service hybrid cloud architectures will offer a mix of all types of infrastructure solutions.